If you went to the Reel Rock Film Festival last year, you probably saw a film called "La Dura Dura" featuring Chris Sharma and Adam Ondra working on a climb in Oliana, Spain, that Chris bolted a few years back. In spite of the climb being Chris' creation, he had pretty much dismissed the climb due to it's difficulty. It wasn't until Adam gave it a try and lit a fire in Chris that renewed his interest. Together, Chris and Adam spent 9 weeks working on the project and unlocking the sequences. Here is the new, full video of the realized climb. Professor Raphael Slawinski is not only a master of Physics, he is also a master of ice climbing. When he is not teaching at the Mount Royal University in Calgary, AB, he is out in the mountains climbing. As a nominee for National Geographic Adventurer of the Year, he has some great insight on what drives people to climb. And last, but not least - we may have mentioned this earlier in the blog, but just in case you haven't heard yet - this weekend is RED ROCK RENDEZVOUS!! This next video has some great highlights of all the fun from last year. Hopefully you can make it out. The first video this weekend doesn't feature any amazing climbers crushing their projects, or any deep pillow lines, or any crazy acrobatics. I think this first video features a different kind of stoke - for some it may be even more moving than the regular videos we post here. Hopefully this gets you yearning to get outside and live your life. Days You Remember | Horizons from Mountain Hardwear on Vimeo. For many of us, going to amazing places and seeing some breathtaking scenery are major factors in why we hike, ski, or climb. For their latest project, Chris Sharma and Stefan Glowacz rappelled 160 meters into the belly of the Majlis al Jinn Cave in Oman. Their reward: 13 pitches of overhanging roof climbing in a spectacular setting! Another big reason to get outside is to have a great time with some great friends, and that's what the Salomon Crew is all about in their latest video. They were hoping for powder turns, but got spring break conditions, so they made the best of it! Whatever your reason is, we hope you get outside soon. And if you need help getting there, give the Alpine Institute a call. of the bottom of the photo. The right skyline is the West Ridge. For the Upper North Ridge, you access the mountain from I-90 and approach from the west from Longs Pass Trail and Ingalls Lake, crossing over Goat Pass and the Stuart Glacier. Most teams cross the glacier, scramble up 4th class rock to reach the bivy sites on the ridge, then continue with the climb the next day. The descent for this route takes you down the Cascadian Couloir on the southwest side of the mountain and then back to Long's Pass. Simul-climbing on the 3000' Direct North Ridge of Stuart. Another option for early season climbing is to approach from Leavenworth and the Mountaineer Creek trailhead on the northeast side of the mountain. The bonus to this approach is that you can tackle the Complete North Ridge. With an extra 10 pitches of outstanding climbing added, it is one of the best routes in the range. The flip side to this approach is that you have a more technical descent down the Sherpa Glacier, which is only viable in the early season. Whether you choose to climb the Complete North Ridge, or just the upper half, you still have a big climb ahead of you. 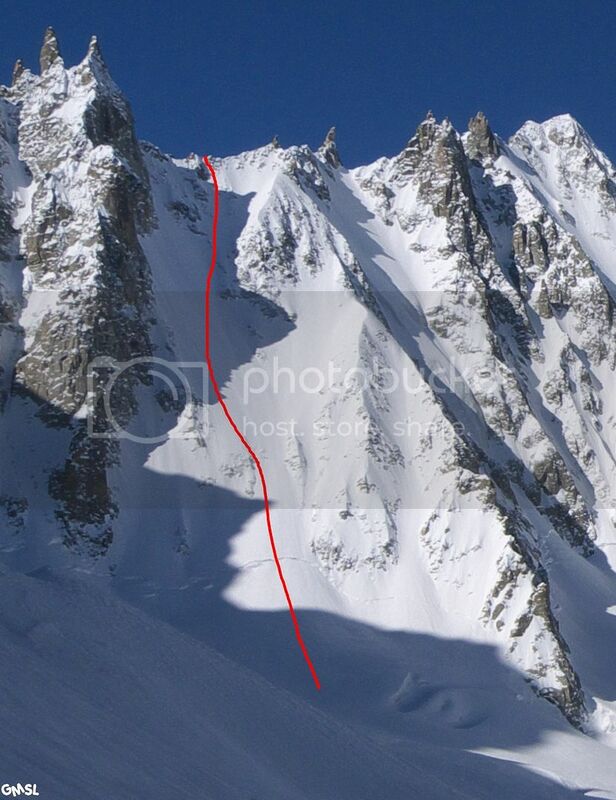 The crux of the climb is the "Great Gendarme" and it's 5.9 short off-width section. However, if you are not quite feeling up to that, you can do a short rappel and skirt around the base of the Gendarme to finish the climb like Don Gordon and John Rupley did with they first climbed this route back in 1956. 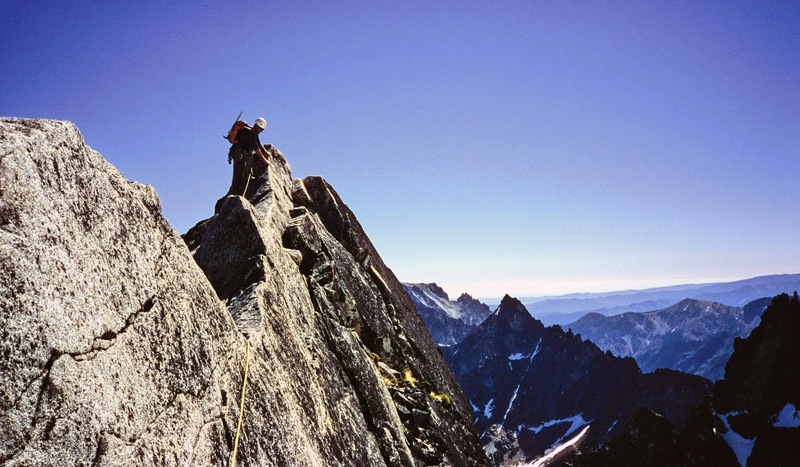 The Complete North Ridge, including the "Great Gendarme," wasn't climbed until 1963 when Fred Beckey and Steve Marts succeeded on the Lower North Ridge West Side. Seven years later, Mead Hargis and Jay Ossiander developed what has become the standard route when approaching from the north east. A panoramic photo from Dragontail Peak, looking north with Mt. Stuart on the left. With the snow and glacier crossing, a mid-route bivy and carry-over, the North Ridge of Mt. Stuart has become one of the crown jewels of Cascade alpinism and has found it's way to the tick lists of many climbers. Mark and Janelle Smiley decided to start working through the list of the "50 Classics in North America" back in 2010. So far, they have 44 completed. 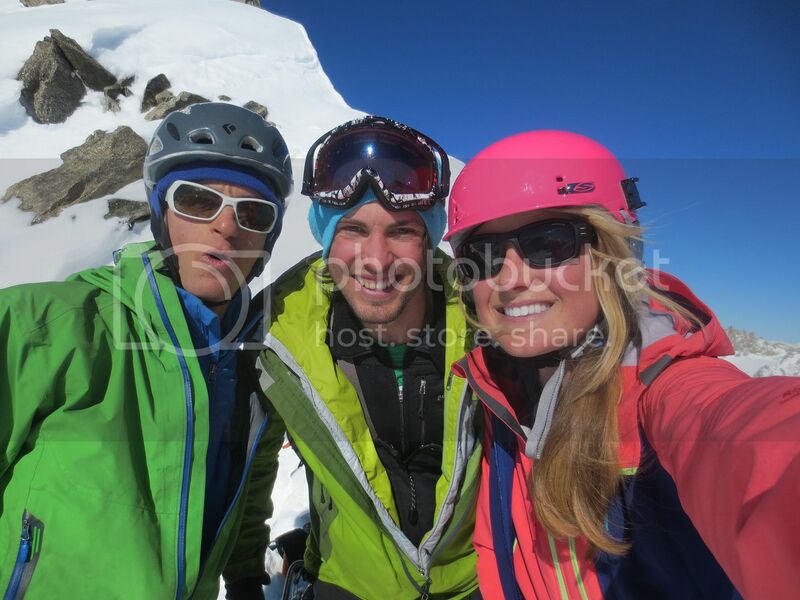 Below is a video they made of their ascent of the North Ridge last summer. If you would like to climb Mt. Stuart, via the North Ridge or any of the other routes, give us a call. We'd love to get you out to experience this Cascade Classic! 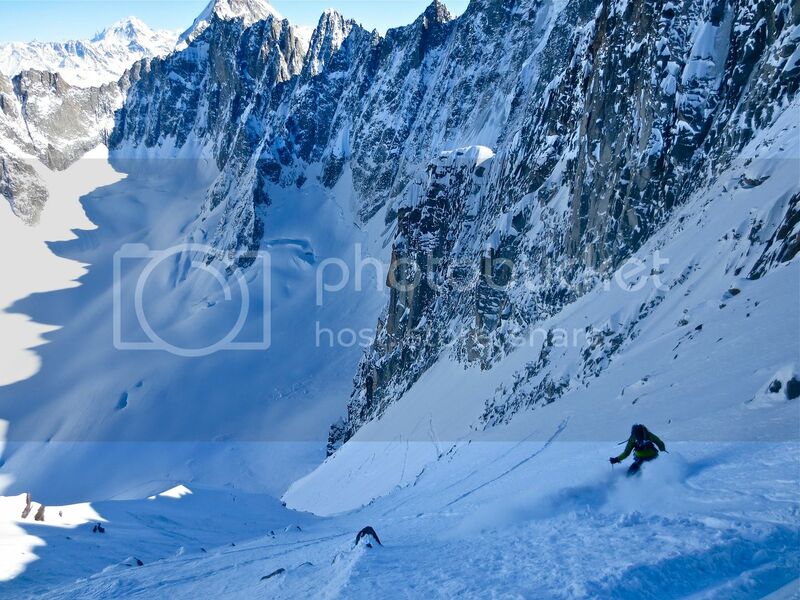 Finally the month long storm has subsided here in Chamonix and we have high pressure forecasted for the foreseeable future. Not that I'm complaining about all the storm and pow riding we've had the past month , it'll just be nice to get out in the mountains and accomplish some bigger objectives! Dave Searle, Emily Roo and I went for a mellow ride down the Mer de Glace the day before to get a look at the Aiguille du Tacul. The snow was deep and dry and the Epaule looked good! 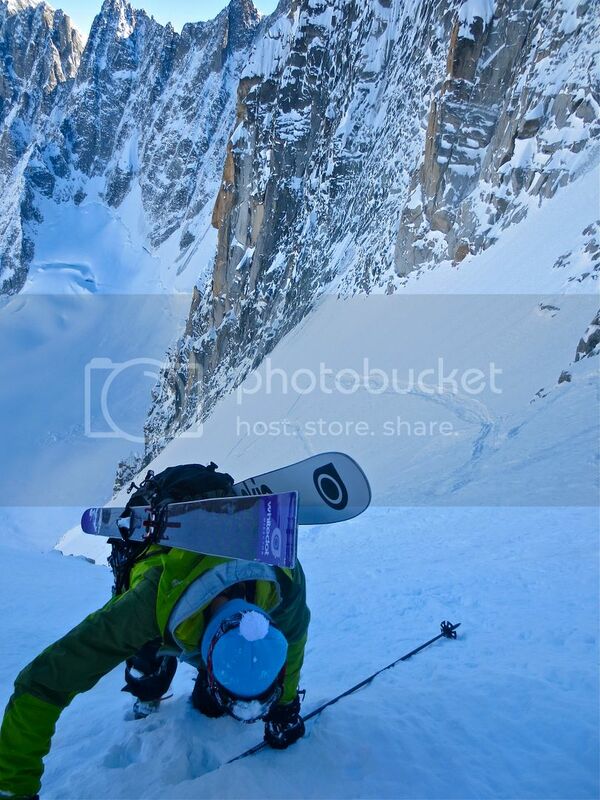 Stoked to get out with Paulie for this mission (fellow splitboarder) we set off from the Midi to send it. I thought we'd be breaking trail to the top but lucky for us there was a vrai extreme ski randonnée frenchman in front of us. Both his skis were as big as one of ours so we broke the other half of the track I guess, haha. Thanks anyway mystery dood! As we approached the bootpack we see two others catching up to us and it was Ben Briggs and Brendan, another splitter! They were off to ride something much more extreme but apparently it wasn't in condition... and for these two it must have really not been in condition. At the top. The blind rollover scares me to death. If it had been just Paulie and I, I'd have probably had him belay me over the convexity and stomped around in there a bit. The snow felt really good but there was a lot of it and this isn't a spot you want to rip for it would mean certain death. But vrai extreme ski randonnée mystery frenchman was eager to open it. I watch him disappear over the rollover. Brendan got to a spot where he could see him and he said it looked good. Ben disappeared then Brendan, then I got up a bit to watch Paulie shred it. It's always a relief to get over the rollover and see that it's not that steep, is super wide and the snow is ideal. Brendan shredding the lower section. I love this line. Super beautiful and really fun, cuz that's what it's all about right? Colorado’s San Juan Mountains, which are situated in the Southwest portion of the state near Ouray, offer some of the finest winter conditions in North America. The combination of excellent snow and ice, aesthetic peaks and accessible high alpine valleys create an almost unparalleled winter sports playground. Engineer Mountain, situated at the heart of the region just off of the “Million Dollar Highway” (Highway 550), exemplifies the climbing opportunities of the region. 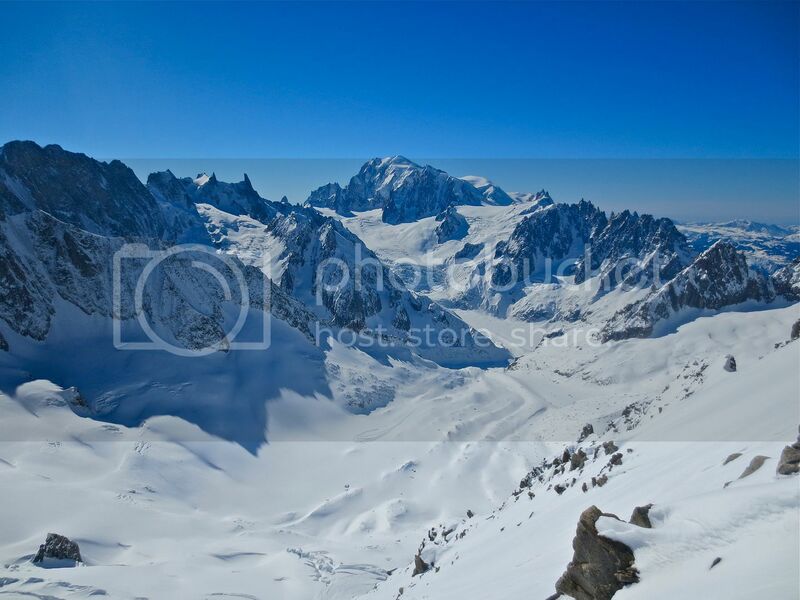 Climbing Engineer Mountain in the winter is an ideal outing for technical winter mountaineering or ski mountaineering training. The relatively short route, which gains roughly 2,400’ over 2.3 miles, starts on Highway 550 near the Pass Creek Trailhead. From there, climbers wind their way north and east into the low spruce forest before cutting back southwest and beginning to tackle the mountain in earnest as they pass tree line. Engineer Mountain's summit stands high over its broad North flank. The broad shoulder of Engineer’s north face is quickly gained, and the relatively low angle climb continues up to the base of the summit ridge. The final climb up the narrow, exposed ridge requires both surefootedness and confidence in one’s technical abilities, while rewarding those who have made the climb with breathtaking panoramic views of the surrounding mountains. The low angle bench reached just before the approach to the summit ridge begins in earnest provides an excellent place for base camp on our Colorado Winter Mountaineering programs. 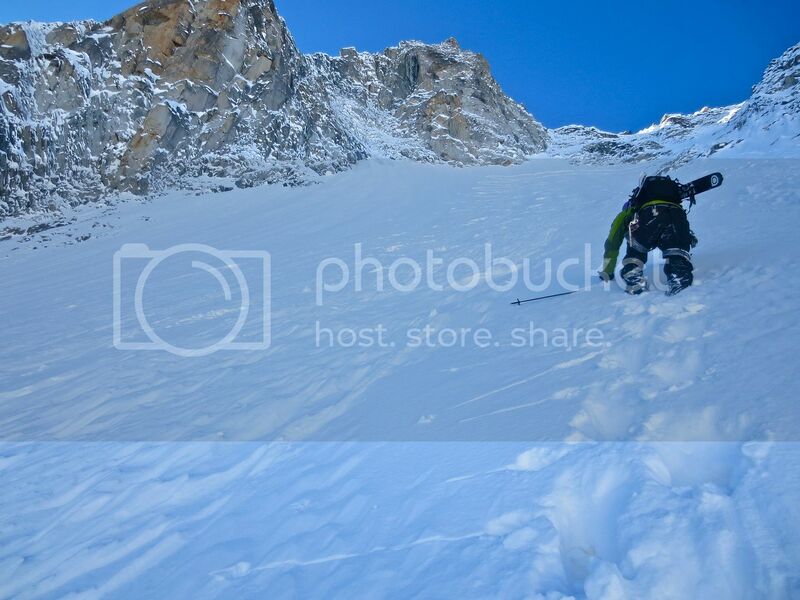 A competent winter climber needs to be able to evaluate snowpack stability and avalanche hazard, mountain weather, route find effectively, create and maintain suitable shelter, and attend meticulously to the details of climbing technique and protective systems. 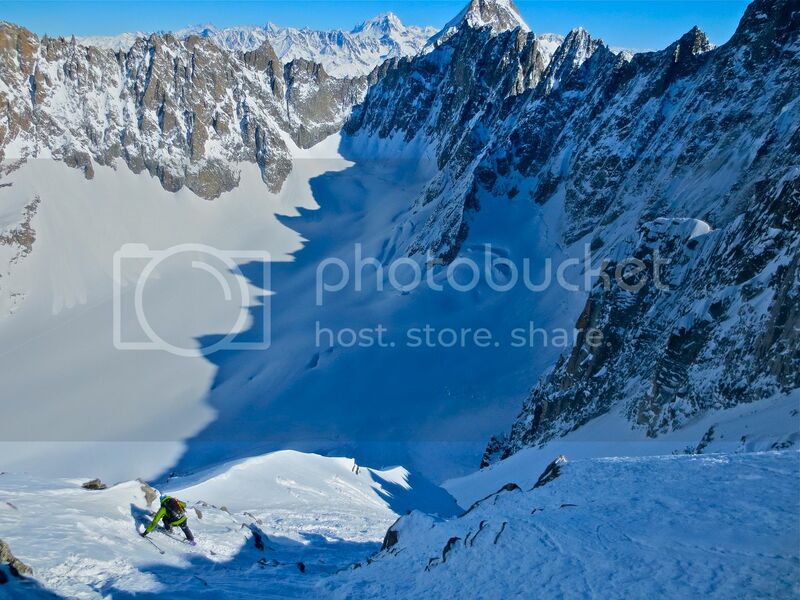 Our base camp provides the ideal place to hone these skills, in addition to working on ski technique before making a rewarding final ascent. The standard Winter route leaves from Highway 550 for the summit. A climber works on skills at Camp Bird Road during a Winter Mountaineering Course. An AAI guide skins South toward Engineer Mountain. Decio Nascimento. A climber, psyched to be on the summit after a rewarding climb. Decio Nascimento. What goes up, must also go down. A climber gazes back down the ridge on Engineer. Engineer Peak is the perfect culminating climb for our Colorado Winter Mountaineering program; we hope to see you all there! I spent last weekend teaching an avalanche course in the Mount Baker backcountry. We had some great conditions for teaching an avalanche course with many unstable layers and lots of new snow. The avalanche problems included storm slabs, wind slabs and a deep persistent slab layer. 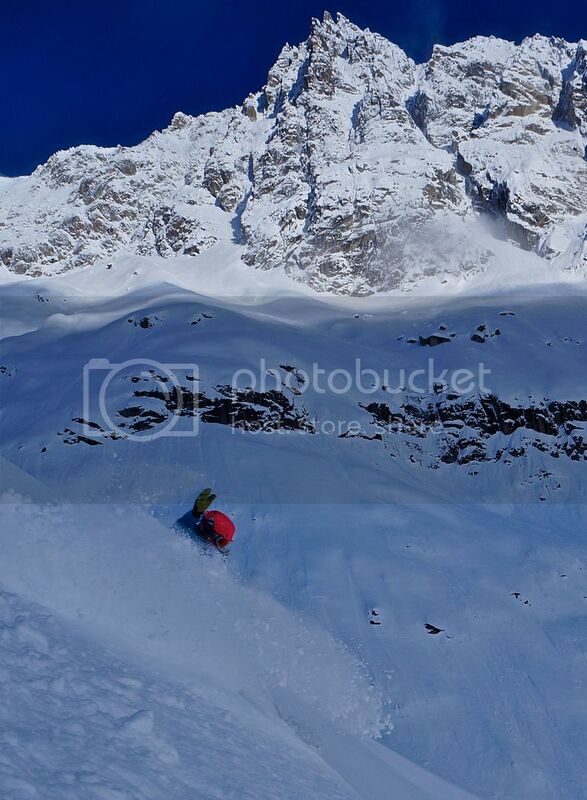 The touring day made for some of the best skiing I have done yet this year. Some amazingly deep snow that stayed light despite some warming temperatures. John Freeman is an ACMG Guide, Rope Access Technician, and a world-class climber. He recently put up a new ice route with Will Gadd in Helmcken Falls. He also belongs to a pretty elite club, although I'm not sure that I want to join his club. John is one of a few climbers who have experienced (and survived) a full ice pillar collapse. Not only did he survive it, it was also documented by his POV camera. In our first video this week, John and Will take us back to the events of that day and share with us some of the thoughts and lessons learned. This next video is just some good, ol' fashioned powder skiing. A few folks from the CU Freestyle Team out having fun in the Colorado steeps and deeps. Pow & Pillows Weekend from Joel Bettner on Vimeo. And finally, I know there are a few of you out there who don't give a rat's @$$ about powder or ice, and would gladly trade both of them for a chalk bag and some crimps. So to satiate you fine folks, here's a great profile of Pat Goodman and the 5.13c "Gun Control" on a sunny day in the New River Gorge. I've spent the last month basically in a little place called Trenchtown, Italy. It's a magical spot 15-minutes from Chamonix filled with fine Italian espresso, spines, awesome tree skiing, steep faces right off the tram tower, the deepest of powder snow and melt in your mouth pizza. If it's not snowing it's bluebird and everyone's always smiling, even the locals. We bought an unlimited Mont Blanc tunnel pass so we were free to go over there at our leisure, maybe even just for dinner if we decided to take a rest day from choking on pow. 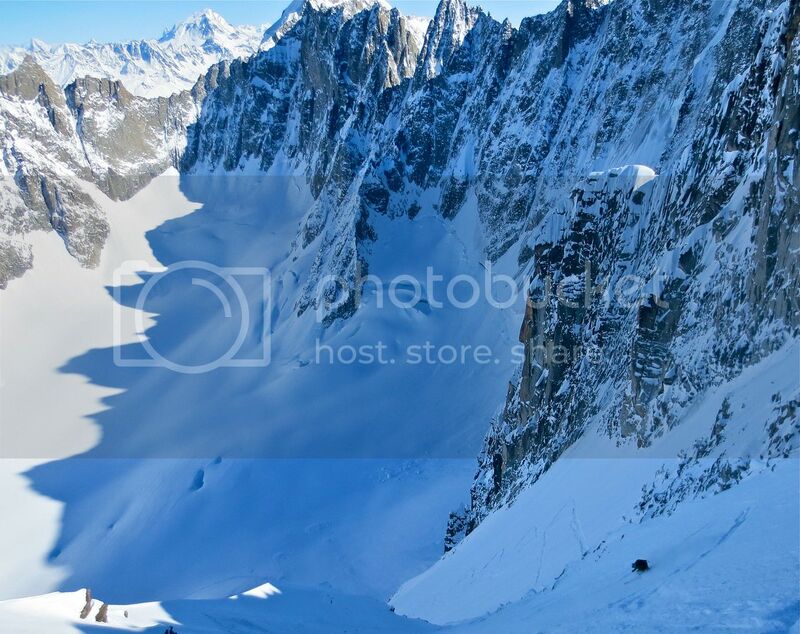 We finally started to see some clearing in the weather last week and I got up into the Argentiere basin to check it out conditions and to remember why I'm spending another season in Chamonix!!!! 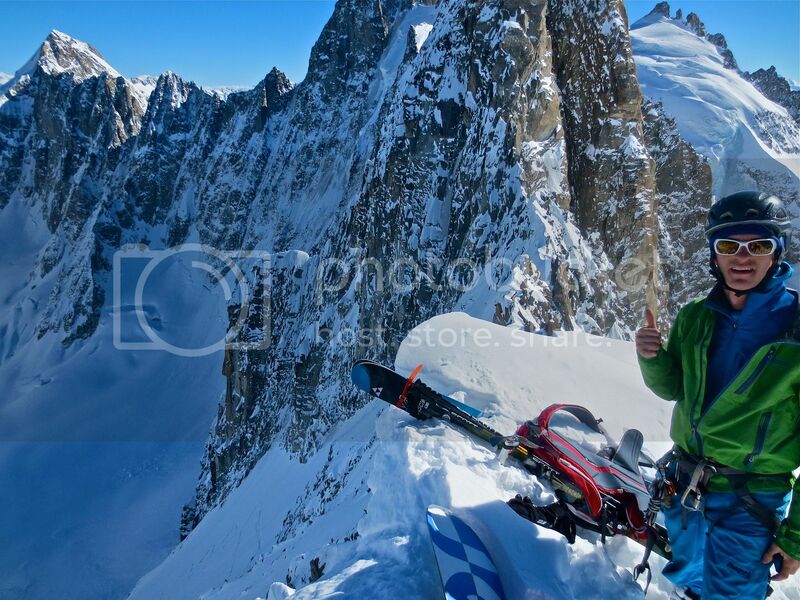 Big tours, big lines, big climbs, big adrenaline AAHHHH!!!! Totally out of touring shape from freeriding the last month a tour up to the Col d'Argentiere kind of hurt, sadly. But a view of the north faces made me feel better. During a night out at Moo Bar after way too many beers and dancing, Ben Briggs, http://www.ben-briggs.com, and fellow American Alpine Institute guide Danny Uhlmann and I decided to head up to ski the Col des Cristaux once the weather cleared again. I've ridden this line before but not for three years so I was amped! 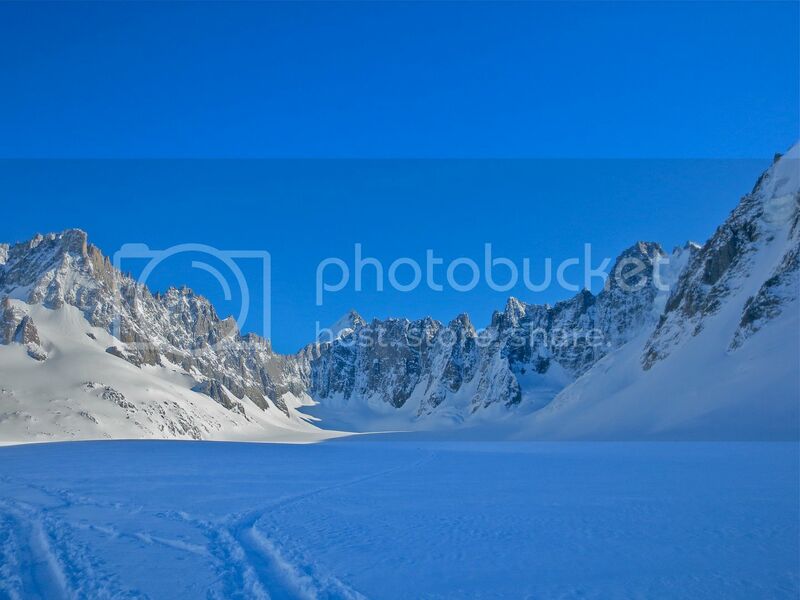 This pic is from http://www.Chamonixtopo.com but conditions were pretty similar. We got to the face and saw three tracks in it. We were stoked, thinking there would be a nice bootpack all the way up... Think again. After roping up to cross the shrund it was deep wallowing for the first hour or so, we took short rotations at breaking this heinous trail. We found the booter for about 100m which was nice then the snow changed to nice firm pow, boosting moral and increasing stoke. The snow got pretty firm with loads of rocks at the top, but we made it! Danny's amping in what I call his "savage pounding" sunglasses. 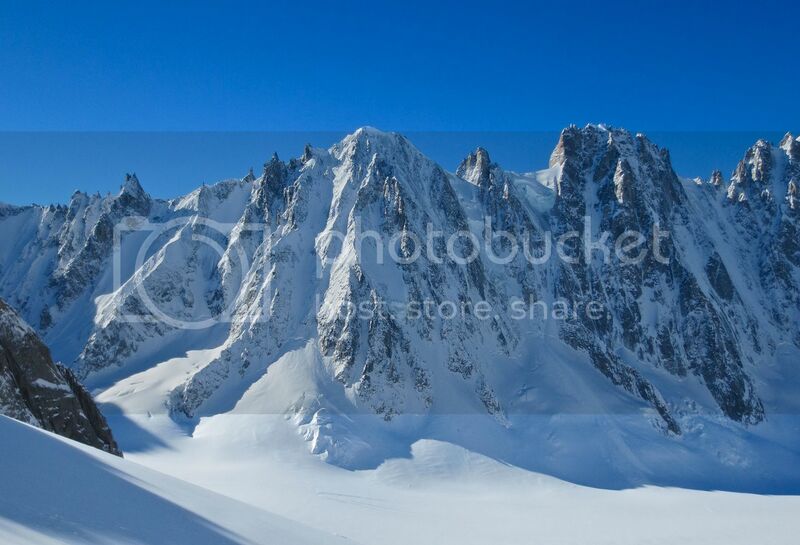 This is one of my favorite views in all of Chamonix! Last time I was in this spot it was sunset and we had a mini epic getting out on the flat glacier because our tracks had filled in. As Danny and I reflect on and discuss whether this unridden portion is going to be rocky or not, Ben charges in. Danny was like "Damn Honeybadger!" Ben doesn't care, he's just crazay! I laughed, and more cautiously shredded it. It's not rocky, it's blower. He's so crazay! I saw the anticipation on his face, the massive grin, red cheeks, wide eyes. Like a steam engine ready to combust. He wasn't waiting for no one then I watched him rip it all the way to the bottom. The snow looked good. Me, next. 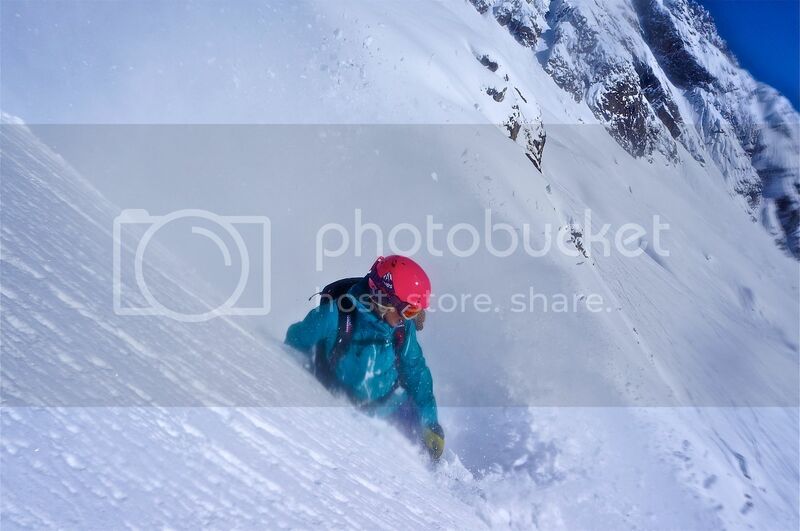 It was such deep powder I think even if you fell in the middle of the face you would've stopped. This picture is so funny because it exemplifies the exact opposite sentiment Ben had at the bottom of the run. 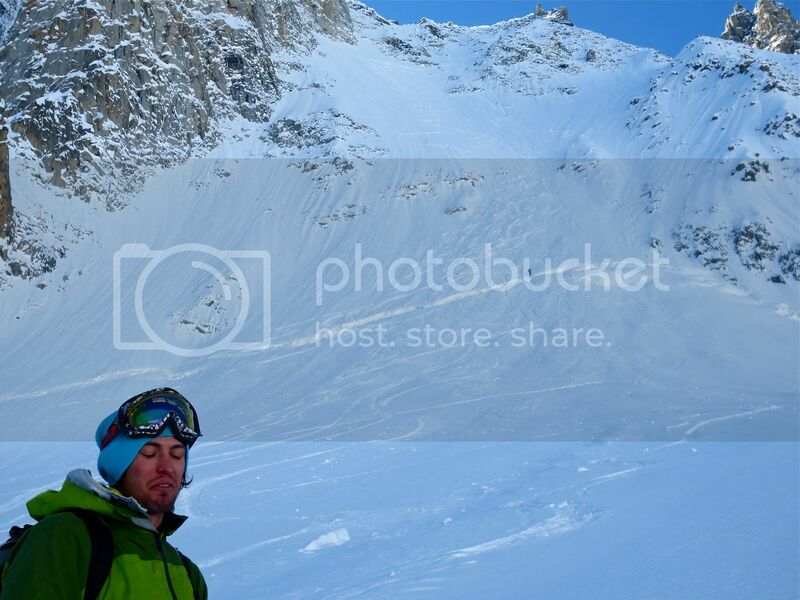 What it does illustrate perfectly is the too cool for school, radditude vibe in Cham though. I'm glad these guys don't have any of that. 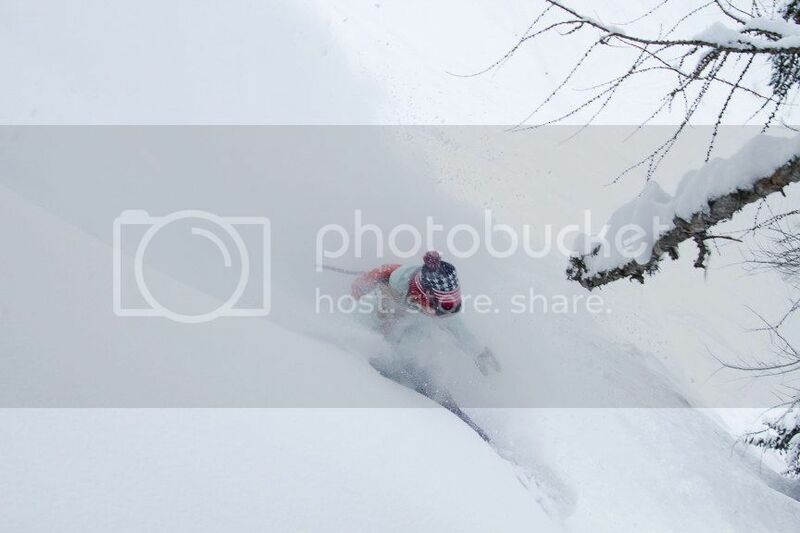 Such a fun day and a great line in awesome conditions! Now for the heinous schooch out of the basin, where I got the schooch leg bad and Danny said I looked stupid and called me handicapped. A snus fixed my leg and my state of mind. Perfectly smooth groomers down the Grand Montets, led us to drinking Panachés in the sun. Thanks for the awesome day boyz! In our first video this week, the folks from Nimbus show us once again that skiing in Japan is as beautiful and amazing as its culture and people. Compass: NIPPON from NIMBUS INDEPENDENT on Vimeo. A few weeks ago, we showed a video from Johan Jonsson completely tearing it up in horrible conditions with little snow. He has now tried to follow that up with another episode, but has encountered an unfortunate problem in his search for bad conditions: too much good snow. Justin Lamoureux can see 30 different mountains from his home in Squamish, BC. While many of his fellow snow lovers head up to Whistler to play, Justin decided to stay close to home and set a goal for himself: to climb and ride each of those 30 peaks in a single season. The next clip is the 4th and final episode of Justin's "Backyard Project."